Effective Vascular Interventions: Are We Comparing Apples to Cows? How do your patients define success? Do they use the same definition that you do? Most vein specialists would describe a successful outcome as occlusion of the affected vein, elimination of reflux, improved disease severity score, and the patient does not complain of further complications or does not return for retreatment of the same vein. Upon completion of the intervention, the practitioner (or hospital) is reimbursed for their time and the resources required for the successful procedure. On the other hand, a patient’s definition of a successful treatment outcome most likely involves a reduction in symptoms, an improvement in appearance, and an increased ability to carry out activities of daily living without pain or limitation. The common denominator in the above descriptions of success, from the surgeon and the patient, is the word improvement. The implication here is that a positive outcome does not automatically indicate that an intervention was effective. In fact, in some cases, such as with the use of compression following treatment, the improvement may have occurred without the "novel" intervention under study. Alternatively, a poor outcome does not stipulate that an intervention was unsuccessful for the patient, but rather for the surgeon’s clinical measure of improvement. If you asked any of your peers if they practice evidence-based medicine, the answer would be a resounding yes. However, one must argue that it is necessary to look beyond the data that has been published when deciding what treatment interventions should be used. The rationale for this is due to the uncontrolled measures of clinical outcomes for superficial venous disease that have plagued clinical trials and investigator-initiated studies. This lack of consensus regarding outcome measures prevents comparison of studies and meta-analyses, and weakens the evidence that is available to stakeholders regarding the efficacy of a given treatment. To clarify, there is no doubt that clinical trials are of paramount importance when assessing new technologies, drugs, and devices in order to ascertain clinical efficacy, safety profile, and regulatory approval. Yet, how many times have you, as a practitioner, been asked how to design a clinical trial for a device or a technology that you would use? How many times have patients been queried as to what they would consider a successful outcome following a treatment? Additionally, when it comes to reimbursement, how many trials are designed to collect data that resonate with payers? "It is difficult to identify a single causative factor leading to the observed variations in outcomes. Yet, the large variability opens the data up to interpretation that could be biased depending on the individual assessing the outcomes." More often than not, clinical trial designs resemble a simple mathematical equation (e.g. disease + treatment = outcome) versus an algebraic word problem (e.g. patient X has 17 symptoms and patient Y has 12 symptoms, how long would it take to resolve all of those symptoms if your clinic saw seven patients every four hours?). More simply, the designs of clinical trials do not always resemble what one would encounter in a real-life clinic. Indeed, when employing the scientific method, it is necessary to establish a clean hypothesis with a direct outcome measure and an appropriate sample size and demographic. However, to eliminate the need for a high number of patients, which translates to higher study costs, the patient population is often homogeneous and variability is minimized as much as possible from patient inclusion criteria to compliance with procedure (physician-influenced outcome bias) and post-treatment care (patient-influenced outcome bias). As a result of this discrepancy, there is not only substantial variability in the reported outcomes data, but also a profound disconnect in endpoint definitions that are used for similar outcome measures. Incidentally, this has created a significant barrier for comparison of results across the published literature. All of a sudden, evidence-based medicine is characterized by a significant heterogeneity of endpoints. Now, similar to the discrepancy between surgeon and patient definitions of successful treatments, the trials in the peer-reviewed literature are often difficult to interpret and compare because they do not utilize uniform clinical endpoint definitions. How did we get to these clinical discrepancies? 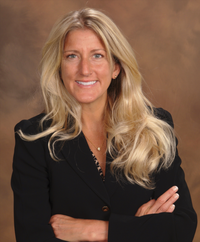 The impetus for this article occurred when a group of physicians were discussing data from a recent study that used duplex ultrasound to identify elimination of reflux in incompetent segments of trunk veins treated with either endovenous thermal ablation (ETA)—defined as laser or radiofrequency ablation—or a combination of ETA and a FDA-approved proprietary endovenous microfoam (Varithena®) (Vasquez and Gasparis, 2016). Data indicated that successful elimination of reflux through the SFJ was achieved in 79% of patients in the ETA group, and 87% of patients in the ETA and proprietary endovenous microfoam group. These data are in stark contrast to previously reported GSV closure rates of 90–95% following ETA (van den Bos et al. 2009, Proebstle et al. 2015). Similarly, in a recent elegant review of 17 clinical studies with five-year follow-up data for duplex response and quality of life (QoL) measures, Huang and Gloviczki (2016) reported that GSV occlusion rates on duplex ultrasound ranged from 62% to 92% for ETA, from 41% to 58% for ultrasound-guided foam sclerotherapy (UGFS) non-proprietary, and from 54% to 85% for surgery. In addition to these wide variations in duplex ultrasound success rates, favorable duplex findings did not always correlate with improvements in QoL measures. It should be noted that the tools used to capture QoL in these 17 studies varied. It is difficult to identify a single causative factor leading to the observed variations in outcomes. Yet, the large variability opens the data up to interpretation that could be biased depending on the individual assessing the outcomes. For example, one payer may declare that the data suggests that there is great uncertainty in the utility of a particular treatment modality. Others may argue that certain studies were not conducted properly, potentially tainting a physician’s likelihood of using that treatment and withholding payment. Perhaps in each case, the simple explanation is that the experimental design and outcome definition was different than previous trials. Should this be the case, when we are attempting to evaluate the efficacy of therapies by comparing data across trials, we are no longer comparing apples to apples, or apples to oranges, but rather apples to cows. At the outset, there needs to be a greater emphasis placed on consistency across clinically-relevant outcome measures, from both a patient and provider standpoint. Likewise, endpoint definitions for clinical measures and PROs should follow uniform reporting standards. In a PubMed search restricted to the one-year period of May 1, 2015 to May 1, 2016, using the key terms “superficial vein,” “incompetence,” “reflux,” “duplex ultrasound” and “treatment,” nine papers were identified. Papers were only included if they provided a definition of what constituted a successful duplex ultrasound response. 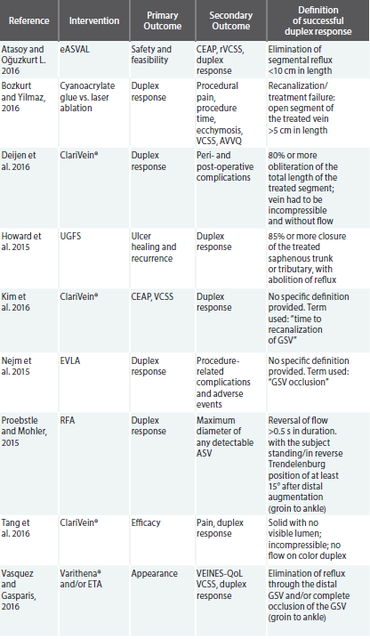 The table below highlights these studies, their primary and secondary outcome measures, and the definition that was used in order to declare a successful duplex response. Of significant concern in the review of the above studies, which were all published within a one-year period, subsequently eliminating bias due to advances in technology and data collection, is the lack of overlap in the definition of a positive duplex response. In reality, there may be a correlation between a lower duplex response rate and a more rigorous duplex responder definition. Consequently, an ill-defined single measure of clinical success is what is driving treatment algorithms and reimbursement initiatives. Accordingly, of the nine papers identified, only three incorporated an outcome measure that considered the impact of the intervention on the patient’s symptoms and well-being. In most cases, the outcome measure was secondary. Of these papers, each chose to use a different index of patient reported outcomes (PROs), from appearance to long-term impact on QoL. Thus, the impact of the PRO data is diluted and we are unable to draw comparisons across studies. Without a uniform metric of a successful patient outcome, we will continue to implement these measures as secondary outcomes, maintaining their status as subordinate. How do we fix these clinical inconsistencies? At the outset, there needs to be a greater emphasis placed on consistency across clinically-relevant outcome measures, from both a patient and provider standpoint. Likewise, endpoint definitions for clinical measures and PROs should follow uniform reporting standards. To do this, the incentive should be to follow clinical practice guidelines and definitions when designing and implementing clinical trial protocols or investigator-initiated studies. Current practice guidelines endorse duplex scanning in conjunction with QoL assessment for follow-up of patients after treatment for chronic venous disease (Gloviczki et al. 2011). However, clinical trials are not always incorporating venous disease-specific QoL instruments that allow for the quantitative assessment of PROs. Consistent use of venous disease-specific PRO instruments will facilitate interpretation of trial results for use in clinical practice. For example, the VVSymQ is a novel instrument that was specifically developed in accordance with the FDA guidance for PROs to evaluate varicose vein symptoms from the patient’s perspective in clinical trials (USDHHS, 2009). 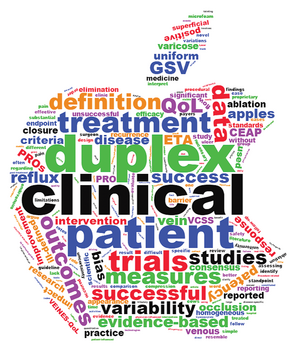 Consensus and uniformity in duplex methodology and PRO assessment will synthesize evidence across trials, inform health policy decision-making, and better assist the reader in evaluating limitations of the clinical outcomes since abnormal duplex findings may not always affect long-term PROs. To date, evidence-based medicine for the treatment of superficial venous disease has had various definitions of success depending on the investigator, practitioner, patient, or policymaker providing the definition. There is a dire need to strive for uniform reporting standards across clinical trials in order to benefit from improved clinical outcomes, patient-reported measures of success, and policy-related support from a reimbursement standpoint. This can only be accomplished by incorporating the efforts of industry, clinicians, and guideline committees across societies. While this sounds like a substantial undertaking, guidelines are already in place, and an emphasis should be made to apply them when designing clinical trials. Additionally, there needs to be better communication between the practitioner and clinical trial research teams, as well as the practitioner and the patient. With the implementation of uniform reporting standards, when we interpret clinical trial outcomes, we will be comparing apples to apples rather than to cows, resulting in a more positive impact for patients, payers, and practitioners. Atasoy MM, Oğuzkurt L. The endovenous ASVAL method: principles and preliminary results. Diagn Interv Radiol. 2016 Jan-Feb;22(1):59-64. Bozkurt AK, Yılmaz MF. A prospective comparison of a new cyanoacrylate glue and laser ablation for the treatment of venous insufficiency. Phlebology. 2016 Mar;31(1 Suppl):106-13. Deijen CL, Schreve MA, Bosma J, de Nie AJ, Leijdekkers VJ, van den Akker PJ, Vahl A. Clarivein mechanochemical ablation of the great and small saphenous vein: Early treatment outcomes of two hospitals. Phlebology. 2016 Apr;31(3):192-7. Gloviczki P, Comerota AJ, Dalsing MC, Eklof BG, Gillespie DL, Gloviczki ML, Lohr JM, McLafferty RB, Meissner MH, Murad MH, Padberg FT, Pappas PJ, Passman MA, Raffetto JD, Vasquez MA, Wakefield TW; Society for Vascular Surgery; American Venous Forum. The care of patients with varicose veins and associated chronic venous diseases: clinical practice guidelines of the Society for Vascular Surgery and the American Venous Forum. J Vasc Surg. 2011 May;53(5 Suppl):2S-48S. Kim PS, Bishawi M, Draughn D, Boter M, Gould C, Koziarski J, Bernstein R, Hamilton R. Mechanochemical ablation for symptomatic great saphenous vein reflux: A two-year follow-up. Phlebology. 2016 Jan 24. Nejm CS Jr, Timi JR, de Araújo WB Jr, Caron FC. Endovenous laser ablation of the great saphenous vein - Varying energy may not affect outcome. Phlebology. 2015 Dec 8. Proebstle TM, Alm BJ, Göckeritz O, Wenzel C, Noppeney T, Lebard C, Sessa C, Creton D, Pichot O. Five-year results from the prospective European multicenter cohort study on radiofrequency segmental thermal ablation for incompetent great saphenous veins. Br J Surg. 2015 Feb;102(3):212-8. Proebstle TM, Möhler T. A longitudinal single-center cohort study on the prevalence and risk of accessory saphenous vein reflux after radiofrequency segmental thermal ablation of great saphenous veins. J Vasc Surg Venous Lymphat Disord. 2015 Jul;3(3):265-9. Tang TY, Kam JW, Gaunt ME. ClariVein®: Early results from a large single-centre series of mechanochemical endovenous ablation for varicose veins. Phlebology. 2016 Feb 22.